Being convicted of Driving Under the Influence in violation of California Penal Code Section 23152 (a) or California Vehicle Code Section 23152 (b) can carry many collateral consequences of which people are not aware. One such consequence arises when a person with a California DUI conviction attempts to travel to Canada and unexpectedly finds that they have been denied entry at the Canadian boarder. Driving Under the Influence is treated as a very serious criminal offense in Canada. Under Canadian law, it is a felony that is punishable by up to five years in prison and is therefore considered an excludable offense under their Immigration Act. The person is also excludable even though they were only convicted of a misdemeanor. If a person is convicted of DUI under California Vehicle Code Section 23152(a) or California Vehicle Code Section 23152(b), or even if he or she is convicted of a reduced charge such as Wet Reckless pursuant to Vehicle Code Section 23103/23103.5 that person can be excluded from admission to Canada. There are three ways that someone with a DUI on their criminal record can gain entry into Canada, depending on the age of the conviction. Someone convicted of a single DUI or Wet Reckless whose sentence has expired over ten years ago (i.e. it has been 10 years since the termination of probation) will fall into the "Deemed Rehabilitated" category and may seek entry into Canada as either a visitor or Permanent Resident. People travelling to Canada may apply for deemed rehabilitation at the Canadian port of entry if this is the case. For someone with two or less DUI or DUI-related convictions whose sentence has expired over five years ago (five years since the termination of probation), he or she is not deemed rehabilitated but instead must apply for rehabilitation at the port of entry in a process called "Streamlined Rehabilitation." Individuals not falling within these two categories (i.e. people with recent or multiple DUI convictions) would need to apply for a "Temporary Residence Permit." While this can be completed and granted at the port of entry, it is strongly advised that application be made at the Canadian Embassy or Consulate. 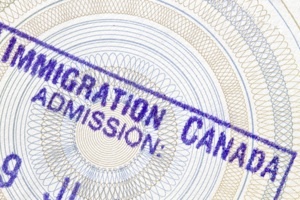 This is a process that can take six months to a year to complete and involves a careful of review of the applicant's situation by a Canadian official. In addition, the nature of the DUI conviction may prevent entry into Canada, regardless of when it occurred. Convictions involving serious property damage, physical harm to a person or any type of weapon may prove to be a barrier to admittance into Canada. In all cases, it is the Canadian Border or Immigration official who has the final word regarding entry. For people whose work or family requires frequent travel to Canada, a DUI conviction can prove to be onerous. Because of the unintended consequences a California DUI conviction can carry, it is crucial that you have an effective and knowledgeable DUI attorney representing you. Michael Kraut is a former deputy district attorney who is skilled at mounting effective defenses to charges of Los Angeles Driving Under the Influence. His hard work on behalf of his clients has led to cases being thrown out or charges being significantly reduced. He has represented many clients who work or live in Canada and has successfully worked to ensure that they can return to Canada even after a Los Angeles DUI arrest. For more information about California DUI and entry into Canada, and to schedule your free consultation, contact Michael Kraut at the Kraut Law Group. Mr. Kraut can be reached 24/7 at 888-334-6344 or 323-464-6453.